DOVER, Del., July 10, 2017 /PRNewswire/ -- The Southeastern Electric Exchange, Inc. (SEE) has recognized the Eight Flags Energy Combined Heat and Power (CHP) Plant as a 2017 Industry Excellence Award winner in the Production category. The CHP plant is a first-of-its-kind for Chesapeake Utilities Corporation (NYSE: CPK) (Chesapeake Utilities) and its subsidiary, Florida Public Utilities Company (FPU). The award was announced during the SEE Annual Conference and Trade Show in Baltimore, Maryland in June. The SEE Industry Excellence Awards recognize utility companies for projects that demonstrate innovation, improvements and technical complexity. "The Eight Flags Energy CHP Plant is a strategic solution designed to meet the needs of our customers and communities while reducing emissions and providing savings," said Michael P. McMasters, President and Chief Executive Officer of Chesapeake Utilities Corporation. "This project is an example of our employees' commitment to developing innovative ways to grow while continuing to deliver increased value to our customers, investors and the communities we serve." 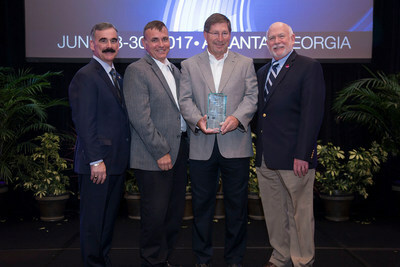 "Florida Public Utilities, a Chesapeake Utilities subsidiary, is one of fifty-four members from across the eastern U.S.," said Scott H. Smith, Director, Southeastern Electric Exchange, Inc. "It was great to see Chesapeake and FPU construct their first production project and be recognized for their significant accomplishment. Not only is the Combined Heat and Power Plant storm hardened, but it provides on-Island generation, which results in less dependence on purchased power and increases reliability for FPU's customers while lowering costs. Congratulations to Chesapeake, FPU and to all of the team members who contributed to this project." The Eight Flags Energy CHP Plant generates approximately 20 MW of base load power, producing enough electricity to meet on average 50 percent of the Island's demand. The CHP Plant operates on natural gas, one of the cleanest, safest and most efficient energy options. The Plant produces three energy outputs: steam, heated water and electricity, the latter of which is purchased by FPU for distribution to its electric customers. The use of natural gas yields lower-cost, highly reliable electricity for FPU's electric retail customers while recovering waste heat to produce thermal energy to support Rayonier's processes. The Eight Flags CHP Plant was completed and put into commercial operation in June 2016, only 50 weeks after mobilization of construction crews at the site. "This plant is one of the most energy-efficient cogeneration power plants in the United States, with a target efficiency of 78 percent," added Jeffry M. Householder, President of Florida Public Utilities Company. "I'm proud of the team of employees and partners who worked diligently to bring this project to fruition. It's a resource that makes a meaningful impact, and I look forward to continuing to find additional ways to best serve our customers and the communities we serve." Florida Public Utilities Company is a wholly-owned subsidiary of Chesapeake Utilities Corporation. Headquartered in Amelia Island, Florida, FPU distributes natural gas and propane and provides electric services to approximately 124,000 customers in markets throughout Florida. For more information, visit www.fpuc.com.